Amaze your party guests with this stunning baby shower banner. 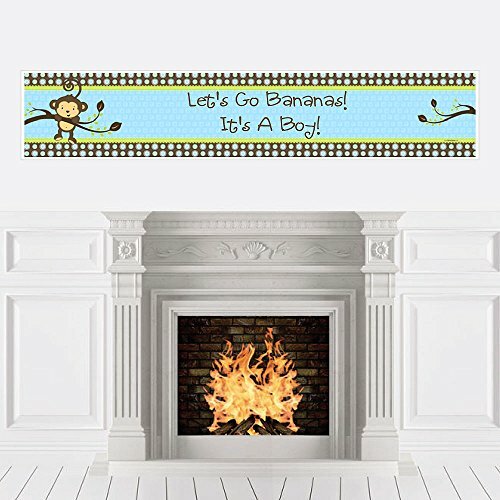 Our Monkey Boy banners are great wall decorations for baby showers and can be saved as a special keepsake for the baby's rooms. Our baby shower banners have two lines of text and have plenty of space for each guest to sign their name if you would like to use the banner as a guest book. Banners are printed on premium-grade satin paper with a photo-like shine that's made in the USA, and can be hung with tape. Add a finishing touch to your baby shower with an adorable banner. Monkey Boy Baby Shower Banner is an impressive baby shower decoration for your baby boy party. SIZE: Monkey Boy baby shower banner measures 1 foot by 5 feet. BABY SHOWER DECORATIONS: A Monkey Boy Baby Shower Banner is an easy way to decorate for your party and bring your baby monkey theme to life. Hang at the entrance of your baby shower, over the food table or candy buffet, at the gift table or behind the dining table. Monkey Boy Baby Shower Banners are also great when displayed outdoors to welcome all of your baby shower party guests as they arrive. PREMIUM BABY SHOWER SUPPLIES: Monkey Boy Baby Shower Banner is professionally printed on premium-grade satin paper with a photo-like shine. Each banner is individually inspected then carefully packaged by hand and rolled into a protective sleeve. All baby shower banners INCLUDE non-marking adhesive wall mounts for easy display. MADE IN THE USA: Monkey Boy - Baby Shower Decorations Party Banner is designed and manufactured at our Wisconsin facility using materials that are Made in the USA.